Chicago is not the blues capital of the world and a major-league contributor to jazz—it has also been an important city for R&B. Countless soul stars came out of the Windy City in the 1950s, 1960s and 1970s, including Tyrone Davis, Gene Chandler, Chaka Khan, the Emotions, Laura Lee and Earth, Wind & Fire. And there were many male vocal groups from Chicago, which was home to the Impressions (the group that Curtis Mayfield and Jerry Butler were a part of before they launched their solo careers), the Dells, the Radiants and the Chi-Lites. Although the Chi-Lites were formed in 1959, it wasn’t until 1969’s “Give It Away” (a Top 10 R&B hit in Billboard) that they finally broke through commercially—and they enjoyed their greatest success in the early to mid-1970s. The Chi-Lites were huge during that era, burning up the R&B charts with funk smokers like “Are You My Woman?” (which Beyoncé Knowles sampled on her 2003 hit “Crazy in Love”) and the sociopolitical “(For God's Sake) Give More Power to the People” in addition to mellifluous ballads and slow jams such as “Have You Seen Her,” “Homely Girl,” “Toby,” “Stoned Out of My Mind” and “A Letter to Myself.” The Chi-Lites often appeared on the pop charts as well; their 1972 ballad “Oh, Girl,” for example, soared to #1 on both the R&B and pop singles charts in Billboard. Indeed, northern sweet soul was very good to the Chi-Lites. When Steppin’ Out was released by Private I/Epic Records in 1984, the times were a-changin’ in R&B. Synthesizers, sequencers and drum machines were becoming increasingly prominent, and R&B producers were being influenced by the high-tech production techniques of hip-hop and German synth-pop pioneers Kraftwerk. Although the Chi-Lites had scored a #7 R&B hit in 1983 with the funky “Bottoms Up,” they weren’t as popular as they had been during their early to mid-1970s heyday—and group leader Eugene Record (b. December 23, 1940, d. July 22, 2005) wanted the Chi-Lites to change with the times. Helping him accomplish that on Steppin’ Out are the two other members of the Chi-Lites’ 1984 lineup: Marshall Thompson (b. August 24, 1942) and Robert “Squirrel” Lester (b. August 16, 1942, d. January 21, 2010), both of whom had been founding members of the original 1959 lineup. Full of synthesizers and drum machines, Steppin’ Out made a concerted effort to appeal to the urban contemporary market of 1984. Record did a lot to help bring that about: in addition to producing the album, he wrote or co-wrote five of the songs (“Do What You Want,” “I Keep Comin’ Back to You,” “Little Girl,” “Let Today Come Back Tomorrow” and “Gimme Whatcha Got”). Uptempo synth-funk grooves are a high priority on Steppin’ Out, and Record isn’t shy about going after the dance floor on “Do What You Want,” “Gimme Whatcha Got” or “Hey, Girl (I Love the Way You Dance).” Nor does Record ignore the dance floor on the infectious “Stop What You’re Doin,’” which was written by Kevin Bell, a.k.a. Amir Bayyan (formerly of the 1970s funk band the Kay-Gees) and is not unlike something the Whispers would have recorded for Solar Records in the 1980s. Bell is the younger brother of two musicians who became famous in Kool & the Gang: Robert “Kool” Bell and Ronald Bell, a.k.a. Khalis Bayyan. Private I/Epic released “Gimme Whatcha Got” and “Stop What You’re Doin’” as singles. Neither were huge hits, although both appeared on Billboard’s R&B singles chart (“Stop What You’re Doin’” reached #33, and “Gimme Whatcha Got” made it to #41). While uptempo dance grooves are a priority on Steppin’ Out, the album has its romantic ballads and slow jams as well: “Let Today Come Back Tomorrow” (which was the b-side of “Gimme Whatcha Got”), “Runnin’ Around” and “Little Girl.” But instead of trying to recapture the old 1970s ballad sound of “Oh, Girl,” “Toby” or “Have You Seen Her,” the ballads and slow jams on this reissue are much closer to what quiet storm stations were playing in 1984. “Runnin’ Around” was written by singer/bassist Jerry Knight, who was a member of Ray Parker, Jr.’s group Raydio until 1980. After leaving Raydio, Knight had a few solo hits (including “Overnight Sensation” and “Perfect Fit”) before forming Ollie & Jerry with drummer/producer Ollie E. Brown and hitting big with “Breakin’: There’s No Stoppin’ Us” (from the hip-hop-themed movie Breakin’) in 1984. 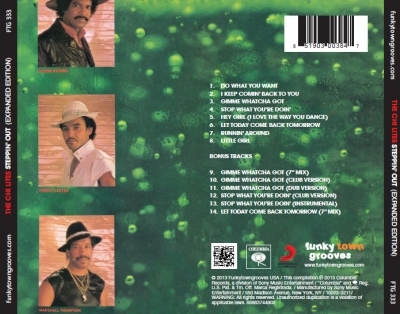 FunkyTownGrooves’ expanded edition of Steppin’ Out contains six bonus tracks, including club and instrumental versions of “Stop What You’re Doin’” and a single version of “Let Today Come Back Tomorrow.” Also offered as bonus material are three different versions of “Gimme Whatcha Got”: a single version, a dub version and an extended club/dance mix. The Chi-Lites have had their share of lineup changes over the years. Record, in fact, was absent from the group in the late 1970s, when he recorded for Warner Bros. Records as a solo artist. But he rejoined the Chi-Lites in 1980 only to leave again in 1988. Sadly, both Record and Lester died of cancer (Record in 2005 at the age of 64, Lester in 2010 at the age of 67). Thompson, who is now 70, is the only surviving member of the 1984 lineup heard on Steppin’ Out. 2013 marks the 54th anniversary of the Chi-Lites, whose current four-person lineup includes Thompson, Frank Reed, Tara Henderson (Thompson’s wife) and Fred Simon (formerly of the Lost Generation, a Chicago soul group that had some hits in the 1970s). Henderson’s participation is an interesting change for the Chi-Lites, who have usually had all-male lineups. For a veteran R&B group like the Chi-Lites—who already had a 25-year history when Steppin’ Out came out 29 years ago—changing with the times can be a challenge. Changing too much can alienate long-time fans, while not changing enough can mean only being heard on oldies stations. It’s a delicate balance, certainly. And in 1984, the Chi-Lites handled that balance with plenty of soul on Steppin’ Out. Alex Henderson’s work has appeared in Billboard, Spin, Creem, The L.A. Weekly, JazzTimes, Jazziz, AlterNet, Cash Box, HITS, CD Review, Skin Two, Black Beat, The Pasadena Weekly, Black Radio Exclusive (BRE), Music Connection, Latin Style, The New York City Jazz Record and many other well-known publications. Henderson (alexvhenderson.com) has also contributed several thousand CD reviews to The All Music Guide’s popular website and series of music reference books.